The Michigan Farm to Institution Network is a space for learning, sharing and working together to get more local food to institutions. We aim to meet the 20% by 2020 goal of the Michigan Good Food Charter. Network Membership is available to Farm to Institution practitioners, farmers, suppliers, advocates, supporters and researchers. 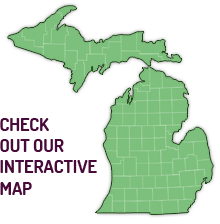 The Michigan Farm to Institution Network is coordinated by the Michigan State University Center for Regional Food Systems. Visit the Network's website for more information.